Scooter tried out an electric guitar in 1997, as per their popular single, "Fire". Two years later, the same experiment unfolds again with "Faster Harder Scooter"! This one is, in theory, a spiritual successor. Now don't confuse this with "Faster Harder Scooter", the final song from their 1995 debut album. Why they chose to give this single the same name is beyond me, but just be aware that they are NOT the same songs. Alright, enough yammering. Let's get faster... harder... Scooter! The Radio Edit is always the obvious candidate to go first, and here we are! Faster Harder Scooter starts out with typical fast beats and the wild lyrics of frontman H.P. Baxxter, this time in choral form, just to add a cool effect. Then, as H.P. lets us know that we're getting faster, harder, Scooter (how do we get Scooter? I guess 'scoot' IS a verb...) over top of some jammin' electric guitar riffs, and the process repeats. The song is mildly catchy, but the hook just isn't as strong as it could be. The electric guitar is more there for show, rather than with any major substance. The Full Length version is practically identical, save for an intro that I presume is from one of their concerts. Or it could just be a random speech. Who knows? The Club Mix features some slightly more off-the-wall percussion, more synths, and an unfortunate absence of guitar. What are you doing, Scooter? Taking the rock out of the clubs? Whaaaa? We're also entitled to a couple of remixes here. Trance expert Sunbeam delivers a mix that starts out sounding rather cosmic before heading into familiar dance territory via an airy synth reinterpretation of Scooter's electric guitar jams. 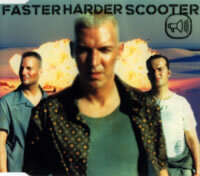 At least, contrary to most remixes from their early years, this is a solid adaptation of Scooter's original material. It's not half-bad either. We also get the Signum Remix, and it actually sounds a bit dry and lifeless in terms of audio quality. The remix itself, however, isn't too bad, either. There's plenty of energy here with its ample use of beeping synths all along the way and its blend of Scooter's melody with his own arpeggiated harmony. This is a far more pleasing remix package than some others from the past. The Limited Edition of the Faster Harder Scooter single had a unique B-Side as well in Monolake, and it's too bad it was in such limited supply because it's a beautifully somber piano-oriented piece that deserves to be heard. "Faster Harder Scooter" is... okay. The single itself is a bit too monotone for my liking; luckily, the remixes tend to pick up on the best aspects and work with them. To be honest, the best song here is Monolake, and that wasn't on the main version of the single. Look for that one first. For all other rockers out there, and those who thoroughly enjoyed "Fire", take a chance and try to get faster, harder, Scooter!